Born in London in 1940 and standing 6 feet 7 inches tall this guy cut a commanding figure. He also played a significant role in the development of British R&B and blues. He began singing in folk clubs and coffee bars in the late fifties and in 1961 fronted Alexis Korner's Blues Incorporated. He appeared on Korner's R&B At The Marquee album the following year. After spending some time on the Continent he returned to the UK in 1963 and became a member of Cyril Davies' All Stars. Davies sadly died in 1964 and Baldry became the band's leader, re-christening them The Hoochie Coochie Men. Rod Stewart was recruited as a second vocalist. 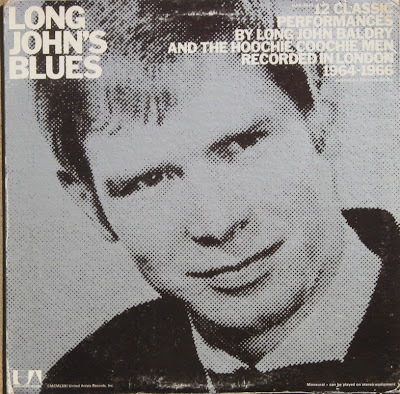 The Long John's Blues album compiles recordings from this era. Baldry's next venture was to help form Steampacket in 1965, although it was during this era that he recorded a number of mostly R&B style solo singles for United Artists, although some, like Cuckoo, were Tom Jones-ish. When Steampacket quit he formed a new backing group, Bluesology, which included a certain Reg Dwight (Elton John) among its members. In 1967 he switched to Pye and with the change of labels came an abrupt change of style. Baldry now turned his back on his R&B and blues roots in favour of some pretty sickly easy-listening ballads. At first this brought him Chart success, most notably a No 1 with Let The Heartaches Begin but he couldn't sustain the momentum and most of his later career was spent as a cabaret artist. Cliff Barton, bass; Billy Law, drums. On "Up Above My Head," Rod Stewart is added on second vocal. On "Going Down Slow,"Five Long Years" and "Bring My Baby Back," Baldry plays guitar. On "Bring My baby Back," Baldry is accompanied by studio musicians of unrecalled identity.